"Love's Deadly Masquerade" is a novel about a young woman, like many, who thought she'd met the man of her dreams, only for him to turn into the monster of her nightmares. The story is centered around a young, beautiful, college co-ed, Vanessa Lofton, who meets the handsome, charismatic and charming Eric Washington while browsing Saks Fifth Avenue with her best friend in King of Prussia Mall. What seemed to be a Cinderella moment in her young life with Eric romancing her into a steamy love affair systematically transformed into a physically, mentally and sexually abusive relationship leaving Vanessa feeling broken, defeated while shredding her self-esteem. Isolating her from her family and friends, Eric solidifies his hold on Vanessa through fear, manipulation and control, causing her to feel that there is no one to help her and no way out. With the help of an older couple who lives next door and has heard the beatings Vanessa has taken during her two year relationship with Eric, she manages to escape and travels through "an Underground Railroad" for female victims of domestic abuse. But Eric is not about to let her get away so easily. 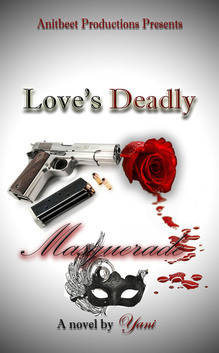 "Love's Deadly Masquerade" shines a light on a victim's mental and emotional state while in an abusive relationship as well as while trying to escape and transition into a healthier lifestyle. It is a relatable, heart wrenching tale showing the damage a victim can be subjected to that people on the outside looking in don't quite understand.